Follow these tips to ensure your guppies thrive. 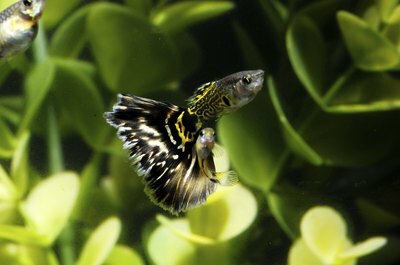 Shira's Guppy Guide makes it clear that learning more about guppies and their care helps you cement your relationship with these low-maintenance fish. Whether you’ve cared for guppies in the past or never had a fish, knowing the specifics about how guppies thrive will make owning them more enjoyable. Guppies are live-bearing fish, and they see their babies as tasty delicacies. The fish tank in which your adult guppies live and breed should be large enough for them and their fry once the babies are large enough to safely live with their parents. A 20-gallon tank will provide sufficient room for all to swim around comfortably and interact with each other, according to the My Aquarium Club website. A mama guppy can easily give birth to as many as 35 fry in one brood; some have given birth to 40, according to The Guppy Site. Feed your guppies only as much food as they can eat in two or three minutes, choosing from a varied diet. Stock up on mosquito larvae, spinach, fish flakes, bloodworms, lettuce, freeze-dried foods and spirulina. It’s not necessary to feed them each of these foods as long as they get a high-quality diet, which contributes to a longer life span, but it's important to vary the mix well. It’s important to remove food they haven't eaten in a few minutes so the food doesn’t collect at the bottom of the tank, decreasing the water quality. Guppies, including yours, consider their fry to be a delicacy -- yuck. As soon as the mama fish appears close to giving birth, scoop her up with a fish net and transfer her to a rearing tank. As soon as she has given birth to all of her fry, transfer her back to the main fish tank. If you plan to raise fry, this rearing tank is essential. It's a safe place to eat, swim and grow until they are large enough to live with their parents. This happy moment should occur when the fry are about 6 months old. The ideal temperature range for your family of guppies is wide, ranging from as low as 69 degrees F to as high as 86 degrees. For their benefit, maintain a temperature at about 82 degrees F. Keep the pH of the water steady, somewhere between 7.0 and 8.5. Live, floating plants mimic the natural environment of the guppy, so add these to your tank. Your guppies are social -- they need the companionship of other guppies to thrive. Guppies are a fin-nipping species, but they can live with certain fish breeds. They’ll do well with peaceful plecos, angelfish, mollies, corydoras, ram cichlids and platies. Their regrettable fin-nipping habit and their mild temperament make other fish types poor choices to include with guppies. Stay away from Siamese fighting fish, acaras, gouramis, Texas cichlids, paradise fish, Jack Dempsey cichlids and just about any cichlid from Central or South America. Keep birth control in mind for your ever-lovin’ guppies. They are prolific breeders -- if you don't limit their breeding opportunities, you’ll be nurturing a rearing tank full with three or four broods from a single mating pair. Female guppies have the ability to store sperm in their bodies for up to six months, meaning they can get pregnant even if she hasn’t bred with her mate. Separate your female guppy from her male mate by putting her into a separate tank or slipping a clear plexiglass divider between her and her mate. Once the fry are old enough, give them to family and friends to keep your tank population at a manageable number. What Catfish Are Safe With Guppies? Do Minnows Get Along With Guppies? What Temperature Should an Aquarium Be for Guppies? How Much Sleep Do Guppies Need?